If you are an entrepreneur or the spouse/partner of an entrepreneur and would like to participate in this study, please take our survey. Surveys are completely confidential. You should set aside 20 minutes and it should be taken independently of your spouse on two separate computers. If you can’t complete the survey in one sitting, the survey is designed to save your place so you can resume at a later time. The research shows there are a number of differences in perceptions between the entrepreneur and their significant others. One example looks at how each partner views the impact of the spouse’s financial contribution to the household income. 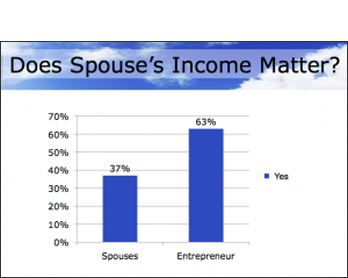 While 63% of entrepreneurs value their significant other’s income – only 37% of spouses believed their income made a difference to the household income. What spouses may not realize is that, regardless of the amount they bring in, that’s that much less their entrepreneur has to take out of the company. Therefore, they are not only contributing the household income, but to the potential success of the business, as well. It is important to consciously recognize each other’s contributions and the impact they make to both the household and the business! 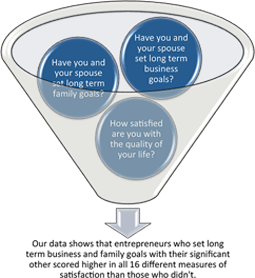 But when you are able to combine a series of 23 questions from 4 separate sections of a survey you wind up with amazing statistics like the following: Entrepreneurs who set long term business and family goals with their significant other scored higher in nearly EVERY area of satisfaction than those who didn’t set long term shared goals. For example, entrepreneurs who set shared business goals were 32% happier with the way they share time with their spouse. In addition, entrepreneurs who set shared family goals were 33% more satisfied with the way they and their spouse talked through things and shared problems with one another. Thanks for letting me be part of your data collection process. It was a two-fer; having a great time getting together for a nice lunch, and getting to share my thoughts on something dear to my heart. I appreciate your sensitivity in the collection and presentation of your data. You have chosen such an interesting area to study, and I’m sure your personal experiences helps give you insight into the crafting of your questions. I learned a lot from you just from our discussion yesterday!